The Earth Imagineers Tour covers the birth of a radical new consciousness and explores how the human body is the most potent tool to change the world. It covers new understandings of what the sun is, how the human heart is a frequency generator that can affect all life and how we interact with light to be this change. Dan Schrieber of Starseed Gardens Austrailia, acclaimed TED ex speaker and visionary shares practical steps about living in harmonic community from successional food forestry and mushrooms cultivation to ferments and aquaponics. Its time for humans to awaken to their true role on the planet, as we become the tools of nature and dance to the tune of the sun. Join the mind blowing Earth Imagineers South Africa Tour for cutting edge practical and visionary information to help you reclaim your health, your life your future. 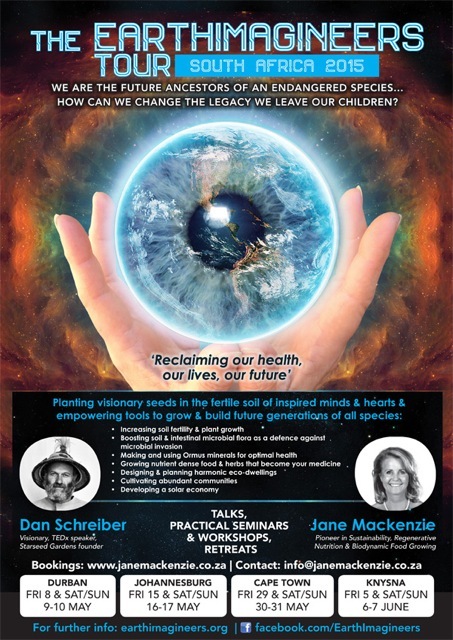 Dan Schrieber is in South Africa touring with Jane Mackenzie, nutritional and green consultant, to inspire everyone wanting to change the legacy we leave our children and become Earth Imagineers: a community of people growing a greener earth using harmonic earth based technologies. 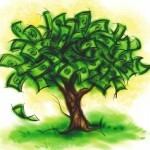 Network, plug in, share information and join the revolution in the way we look at Interdependence and interconnectedness of the soil, nature and ourselves in relationship with the sun, moon and cosmos. Learn about soil fertility and plant growth – Using and making black ‘gold’ compost -Boosting soil & intestinal microbial flora as a defence against microbial invasion – Using and making Effective Micro-organisms and fermented foods and more visionary plans for the future. Earth Imagineers are a community of people growing a greener earth using harmonic earth based technologies from the Ground Up. Businessmen and Women, Artists, Health and Wellness Professionals, Nutritionists, Permaculture Practitioners, Biodynamic Farmers, Vegetable Gardeners, New Systems Dreamers, Open Source Schemers, Architects of new possibilities. Bridge Builders, Community Leaders – Healers….EVERYONE ! Our intention is to inspire a deep ecological and spirit connection to the earth and nurture the imagineering of the inner and outer landscapes in harmony with the natural world. To this end, or beginning, we honour those that choose to share this journey with us, that will contribute their energy to the re-greening of our planet and become midwives to the birth of a golden solar age. We are not the owners of this planet but the custodians, and our responsibility to be in love and integrity at this juncture in time is paramount. 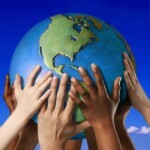 Join us in becoming an Earth Imagineers and re-visioning an abundant and harmonic planet for All. Tues 26th May at Erin Hall, Rondebosch from 7- 9pm. Bookings essential at www.rawlicious.co.za. See Facebook event page here. Thurs 28th May at 7 for 7.30pm-9.30ish (evening), 1 Needles Walk Hout Bay (off Longkloof Rd), Hout Bay. Talks/Discussions – Soup , song and dance. Bring instruments and donations. If interested contact on 083 3673624. Friday 29th May at Spier Shed from 7pm – 8.30pm. See Facebook event page here. Sat/Sun 30/31st May at Spier Shed from 10 am – 5pm. See Facebook event page here. Bookings for the tour can be made here.